Glacier capped mountains, alpine meadows, spectacular Pacific coast, primeval forests, fish and wildlife, sparkling streams and lakes, Indian and pioneer history, biological diversity, exceptionally clean air, wilderness solitude... that is the description that the National Park Service assigns this park. Any of these standalone attributes is rich on its own merit--and at Olympic National Park in Washington state, you can experience them all in one day. 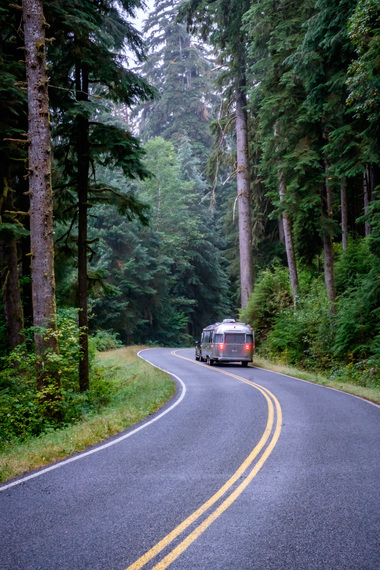 It is one of the few national parks, if not the only park, that contains within its boundaries alpine mountains, temperate old-growth rainforests, and oceanic coastline. The mountains of the Olympic Range are dramatic with their jagged, glacier-capped peaks that are continuously carved away by high-elevation winds. The forests are blanketed in technicolor green, enfolding you in a nucleus of living biology in what is arguably the greenest, lushest, and most diverse rainforest in all of North America. 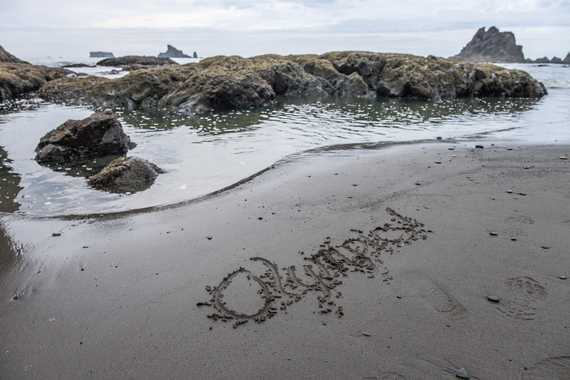 The Pacific Ocean rages wild, forming sea-stacks, living tide pools, and perfectly smoothed stones shaped by the world's largest ocean, laying ground for endless mounds of driftwood to sit on, to play on, and to throw on top of your by-the-sea campfire. These are not just words--there is a profound natural beauty in the great Pacific Northwest, and one of the finest samplings can be found in the Olympics. Weather eclipsed our photography at Hurricane Ridge this year so unfortunately, we have no photos of our own to illustrate the beautiful mountain-scape--so we share this instead, a wonderful shot of the Hurricane Ridge Visitor Center captured by the National Park Service. Do you believe in magic? How about magical places? The Hoh Rainforest is proof that they exist. Under the canopy, the health of the ancient rainforest is evident--every square inch of land beneath your feet and all of the area surrounding you is drenched with vegetation, tree bark, leaves, and foliage. 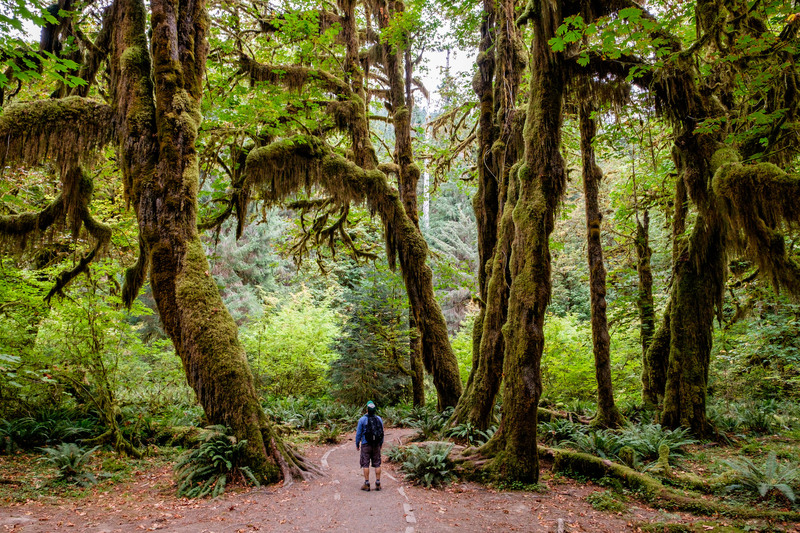 National Geographic Travel notes that moss-covered Sitka Spruce and Western Hemlock trees reach heights of up to 300 feet. It is otherworldly. Supernatural. One of our dear friends described it as "absolute chaos"--and it is in the very best way. It's a little bit like a Monet painting--picturesque from even the smallest distance but incredibly detailed when you have a closer look. 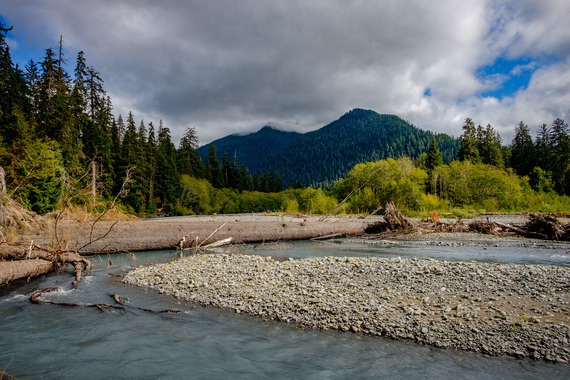 The best way to explore Hoh is to set out on the Hoh River Trail meandering through an enchanting world of old-growth trees and its colorful backdrop on a flat and easy trail. If you follow the trail to Five-Mile Island and back to the Visitor Center from where you started you will have wandered 10 miles through spruce, cedar, fir, and other coniferous trees that helped to earn Washington the name "The Evergreen State." The best part about this trail is that it is relatively non-committal--you can easily turn back any time you please and you never feel as though you are missing "major viewpoints" because the major viewpoints are all around you, the entire way. 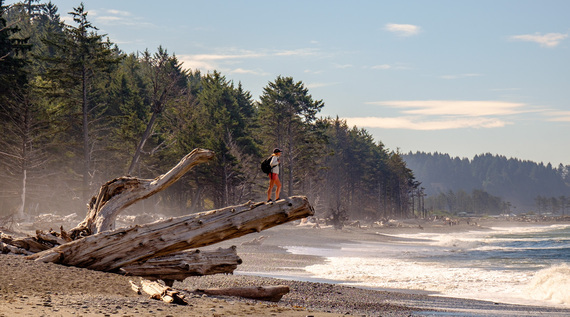 Stretching 73 miles aside the Pacific Ocean in Olympic National Park is a coastline that provides some of the best beach camping, beachcombing, tide-pooling, and general discovery that there is anywhere in the nation. Look left and you'll see the ocean; look to the right, the forest. And straight ahead is just beach and all that comes with it--stones smoothed by the ocean, stretches of sand, giant mounds of driftwood, towering rock formations on land and sea-stacks off shore, and birds soaring above the roaring icy-blue Pacific Ocean. One of the most popular areas is Mora's Hole-in-the-Wall for its amazing geology, tide-pools, and forest trails that wind aside the beachfront--a fine place to pitch a tent! We've camped at both Third Beach and Second Beach in the past, and they are remarkable as well. With such a long stretch of national park-protected shore, variety is on your side--no two beaches are the same and they all welcome different experiences to be had in each of them.